Anyone who digs Steve Hillage or Gong really needs to pick this up. The performances are quite strong and it’s kind of a rare treat in a lot of ways. The title performance is from 2006, and all are captured with good video and audio recording. That’s not the end of it all, though. There are some tracks from a 1979 concert and one from a Gong concert in 1974. 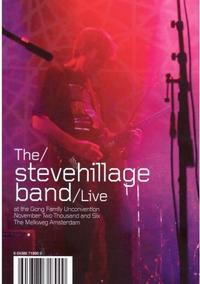 This would not only be highly recommended for long time fans, but also for someone wanting to see what Steve Hillage and Gong are all about. I reviewed the companion audio set in the same issue of Music Street Journal, so check that one for more specific information about the songs played.